The Liturgy of the Word and the Liturgy of the Eucharist comprise the lengthiest components of the Mass. But neither can be fully effective — that is, capable of achieving full, conscious and active participation called for in “Sacrosanctum Concilium,” the Second Vatican Council’s Constitution on the Sacred Liturgy — without a proper celebration of what precedes them. That would be the introductory rites — the entrance, the greeting, the penitential act, the Gloria, the Kyrie and the collect (opening prayer) — that taken together “have the character of a beginning, an introduction and a preparation,” states the General Instruction of the Roman Missal (No. 46). Indeed, while the choice of a seasonally and liturgically appropriate hymn is important, it is the act of singing communally that makes the entrance most effective — gathering worshippers, who come with all variety of cares, concerns, trials and tribulations, into one body in the house of the Lord, setting the tone (as Father Foley suggests) for building unity and community. Upon reaching the sanctuary, the celebrant reverences the altar, leads the assembly in the sign of the cross and offers a greeting in which he welcomes the faithful and briefly introduces them to the Mass of the day. Collectively, this procedure acknowledges the presence of Christ in both the altar, where the consecration of body and blood will occur, and in the gathered assembly, “as a celebrated mode of Christ’s presence,” says Father Foley. The penitential act that follows takes the formula of a general confession and acknowledgement of sins, and may include the Confiteor (“I confess …”) or a Kyrie chant preceded by a litany of tropes (e.g., “You were sent to heal the contrite of heart”). During the Easter Season, the penitential act is often omitted in favor of a sprinkling rite to remind Catholics of their baptism. The act concludes with the priest’s absolution which, the general instruction stresses, lacks “the efficacy of the sacrament of penance” (No. 51). This action, rather, is closely linked to Jesus’ invitation of forgiveness that radiates from the table, exemplified by his willingness to dine with sinners. Unless it was already used in the penitential act, the Kyrie follows, enabling the faithful to acclaim the Lord and implore his mercy (No. 52). 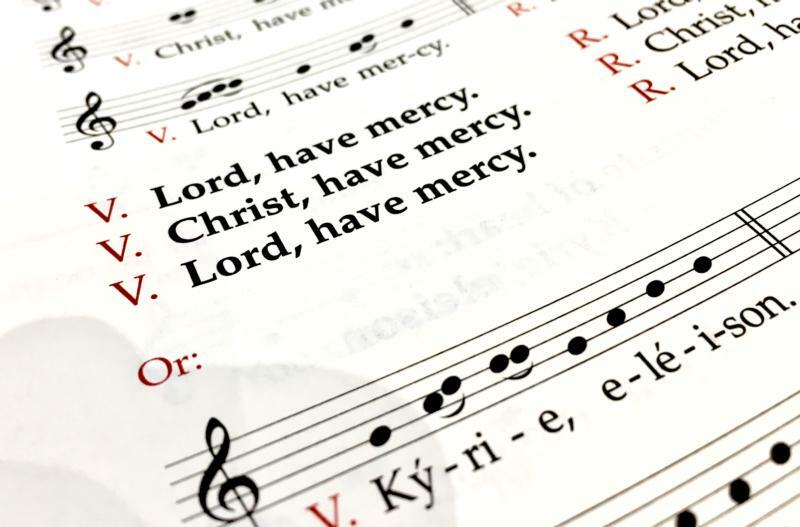 A responsorial chant sung by all, it focuses on the mercy of God through Christ. In the Gloria, the church, “gathered in the Holy Spirit,” is called to glorify Father and Son (No. 53). It is sung or recited on Sundays outside of Advent and Lent as well as on solemnities and feasts. Concluding the introductory rites is the collect, sometimes called the opening prayer, introduced by the celebrant (“Let us pray …”). After a period of silence for all to be conscious of God’s presence and silently bring their concerns and needs to the liturgy, the celebrant expresses the character of the celebration in prayer to God the Father, through Christ, in the Holy Spirit. That celebration now continues with the Liturgy of the Word — ideally, amid a community well prepared by celebrating the introductory rites as one body in the Lord.